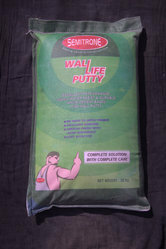 Leading Manufacturer of max wall life putty from Ahmedabad. MAX WALL LIFE PUTTY is highly modified white cement based putty manufactured from high performing special graded, tested imported ingredients, binders and polymers for obtaining excellent results. MAX WALL LIFE PUTTY gives highly water resist, excellent bond; durable and extra smooth finish with very good coverage and less consumption of paint. Gives smooth, decent finish to uneven surface of cement plaster. Gives glossy finish and hence reduces paint consumption to the wall. Highly durable which improves paint life. Smooth finish gives better look. Long life and durable, Highly Water Resist & High bonding. Can use in External and Internal areas of application. Remove all loose / sticky material, dust and other contaminates from the wall. Add 25 to 35 % clean water in to putty to make smooth homogeneous paste. Agitate the mix of water and putty for 5-10 minutes for making lump free uniform paste. Make small amount of paste which can be used within 2-3 hours. Roughen the wall with coarse sand paper before application, if wall is smooth. Apply with putty blade in downward to upward direction. Let the surface dry for 3 hours after 1st coat, rub the surface gently with cloth before 2nd coat. After removing of loose particle from single coated wall, apply second coat. Thickness of two coat maximum up to 1.5mm is recommended. No water curing is required when applied on new plastered wall. Cure with plenty of water before application -if the wall have water absorbing tendency. Use plenty of water to cool the wall (to avoid water loss from putty paste) in hot weather. Application should be done in morning or late evening in hot season to avoid water loss. In rainy season –avoid extra water dripping which disturbs consistency.